Horror director Douglas Schulze’s Dark Fields (read my review) will air on US cable channel Showtime on April 28th. The film is a highly original tale about the town of Perseverance whose inhabitants are cursed. They must sacrifice their children on a yearly basis using a lottery to choose the next victim. The interwoven tale is set in the 1880’s, the 1950’s and the present day. The film stars such familiar faces as the late David Carradine, Dee Wallace and Richard Lynch. A short story by Shirley Jackson called The Lottery. I was in college reading it one night when it was raining outside and the idea for Dark Fields kind of came to me; the idea of a farming community that needed rain and what lengths they would be willing to go to get it. Dark Fields has a very distinct look. How did you achieve this? The idea of making each time period look distinctly different was a conscious effort. We filmed the 1950s in super 35mm and then the RED technology was used for the remaining two tales. I was going to use super 16mm for the 1800s tale but the RED footage was so impressive and we were able to do so much with it in post that we opted to use it for the 1800s tale. The film is three interwoven tales – how did you come up with the concept. I came up with the basic concept (a drought stricken farming community that turns to human sacrifice to appease an evil that haunts Dark Fields) years ago and as I did the back story I soon concluded that the history of the curse was as rich, if not richer, than the main story. Soon I found I had a kind of epic tale in this farming community; an epic that spanned several centuries. I was unsure how I would tackle such an ambitious project until I saw the film The Hours with Nicole Kidman – then a light bulb went off and I had my answer; weave the three timelines together as one tale. Dark Fields is a very unconventional and original horror. Did you come under any pressure to make it more traditional? Well by ‘traditional’ I think you mean what is considered traditional today ala Saw or Hostel. I think an artist starts to travel down a slippery slope when they try to create something that is consciously traditional or conventional. As cliché as it sounds, I try to work from what “feels right” as an artist. But as we funded the project ourselves there was no pressure from an outside source to make the story any more or less commercial. I would argue that the very things that make Dark Fields unconventional are the things that audiences will find appealing – it’s different. The themes of redemption and taking responsibility for your own actions and those of your ancestor’s runs through all three segments of the film. Do you feel that this is something that’s important to the world today? Yeah I wouldn’t have made the film if I had to sacrifice (no pun intended) the films moral premise. To me all great films are built on or around a strong moral premise. And sure, this idea of redemption and accepting the blame for our sins instead of passing them on to our children is enormously important and relevant. From watching the film it appears to be three or four types of horror in one –ghost/gothic, monster and stalker/slasher film – is that just my perception or is it something that you planned? The idea was to create a horror that would be “malleable” (if that’s the right word) to the different generations. The horror starts out very earthen and primal in the 1800s but then it becomes more “monster” like (and makeup driven) in the 50s and finally it achieves a supernatural status by modern day. So yeah, the idea was to have the evil/horror evolve and grow. Dark Fields has a very interesting cast. Can you tell me how that cast came together? I always wanted to work with these three icons; Carradine, Lynch and Dee Wallace. I’m a huge fan of their work. Lynch had all but fallen off the radar and I felt he was an amazing talent that people had forgotten about. I see him to this film as Carradine was to Kill Bill. David was someone I always respected and I just wrote him one day (not thinking he’d reply) and he did. So each actor was carefully selected and I was amazed that these were all first choices and they were all game. They all really liked the story. Lynch had kind of frightened me from his days doing horror like Bad Dreams; which is a creepy old horror film. And Dee is the ultimate Mom with ET and Cujo – she was a natural fit. You seem to have created a pretty iconic horror character with Tiren Jhames’ Mr Saul. Is there a franchise possibility there? Our hope is to return to Perseverance again either with a sequel or a mini-series. And Mr. Saul is definitely poised to return. There are quite a lot of special effects in the film. What sort of problems do you face when creating special effects on a limited budget? One of the main characters is named Cari Lumis. Is this a nod to Stephen King’s Carrie and Donald Pleasance’s character in the Halloween films (Dr Loomis)? Yeah it’s a nod to (John) Carpenter. What sort of problems do you face when making a low budget film in general? Well the good news is you have more freedom but the bad news is that the lack of funding tends to restrict what you can do with this freedom. I mean if you have a problem on a medium or big budget film you can throw cash at it and it will go away but with a low budget film you need to be more creative. So the problems we tended to face were usually things like a location wanting to kick us out because of time issues and if we had more money we’d have just paid them off. Or in David’s case we’d paid to have him for x number of days and another day or two would have been nice but the money wasn’t there. That sort of stuff. You’re based in Michigan. What sort of film industry do they have there? Michigan was once the world leader for commercial, industrial filmmaking. The State just passed a 42% film tax rebate so Hollywood is bringing lots of films here. Studios are starting to open here. AND I run a film school here that is fairly well known around the country (mpifilm.com). So there is an industry here and it’s growing every day. Tell me about MPI Film and what made you develop the school? Twelve years ago we produced our first indie horror film HellMaster with John Saxon and David Emge (Dawn of the Dead). It’s not a great film by any stretch but it made it to HBO/Cinemax etc. We did that film as independents and when we sold the film we were approached by local colleges to come and speak about independent filmmaking (how one finds money, sells and makes a film outside of Hollywood etc.) In fact interest from aspiring filmmakers was so strong that we started to hold these three day workshops. These workshops evolved into short form programs and us being asked to teach. Then someone from the Michigan Department of Education suggested we license our program and make it official. So instead of heading west to Hollywood, myself and my producing partner, Kurt Mayry, formed Michigan’s first film trade school. The idea was to offer “hands on” training in an “on set” environment – something that didn’t exist here ten years ago. The school became a labor of love and it has grown over the past decade to become a nationally respected film institute. We had a student from Kenya this year. The MPI philosophy is to offer a home to independent filmmakers. They pay for a year of formal training but can return to the institute year after year and access gear and find support from faculty. I also run a Director’s Club for graduates who have yet to hit their stride and feel they need a bit more structure. It’s free of charge to MPI alumni. I devote my time and bring filmmakers together to provide them unconditional support and motivation. I’m sure you know how hard it is to keep motivation up when Hollywood isn’t calling you back. So MPI is much more than a film school it’s a kind of filmmaking commune. Do you feel that an education in film is important before you start making films? Do I feel a film education is important? Hell YES. If you’re not willing or wanting to attend formal film school then you’ll need to learn the craft by doing. This will likely mean you will spend several years learning how to make films by making them on your own; and that is a form of schooling. Without film school it may take 4-5 years before a self-taught filmmaker makes a really good movie. So either way you need schooling. Schooling might just mean real world experience. But what’s good about film school is that you will probably hit your stride sooner than a self-trained filmmaker because you’re in a structured environment, learning from people who’ve made lots of mistakes. These people can help you to avoid pitfalls that you’d otherwise make on your own. School also provides structure – something many filmmakers desperately need. Structure and deadlines. School also introduces you to other filmmakers who may become your future writing or producing partners so school can be a great place to network. In fact the benefits of school are almost immeasurable. I could get into the whole mental growth that I see young directors go through during the course of their formal schooling with us but I’d be rambling. Talk me through the process of making an independent film? Write the script then find the money. Then try to find more money. Then make the movie while trying to find even more money. Then the film sits as you try to find more money to complete it. Then you try to find money to create a marketing campaign to get the film to the right people. Then you try to make money with the film. And in-between the quest for money you keep reminding yourself that you are an artist and that you are in this for the love of the art not the money. Haha. What are the main challenges of working in the independent arena? See the answers to the last question. But seriously the quest for funding and distribution is really the plight of the independent filmmaker. Finding enough resources to make your art. Filmmaking is the world’s most expensive art form and making a film takes money. What freedoms do you feel that you have? The freedoms are almost limitless. You can say or do whatever you feel on screen BUT you need to be mindful that no one has promised to buy what you are making so you need to keep that important factoid in the back of your head all the time; its art versus commerce. Sure I could make a three hour film that I might find entertaining but if no one wants to buy it I’m screwed. So you have the freedom to take risks so long as those risks pay off. Because if they don’t you may not have that freedom anymore. My brother made super 8mm movies and I used to watch him. I always wanted to be a filmmaker from age 5 on so I never wanted to do anything else. What made you want to become a horror film director? I grew up watching horror movies. I loved them; the good ones, the bad ones. Horror films, to me, were fun. I loved the rollercoaster ride that came from watching a good horror movie. I think we all like being scared within a safe zone; right? Isn’t that what a roller coaster ride is? A haunted house ride? It’s all about being spooked yet knowing you’re really safe. It’s fun. I also think the horror genre is a great genre for storytelling in general. Conflict can be taken to such an extreme. I’ve always felt that the horror genre works better on a low budget. Do you agree with this? If so, why/not? I do agree. Sometimes there is a sense of realism that comes with a low budget film (as ironic as that might sound). Night of the Living Dead, Open Water, Blair Witch, Evil Dead, Halloween are all great examples of films that are far more effective because they were low budget. But Alien and The Exorcist are also great examples of how a budget can help a horror film. But what you are saying is true. So a sense of crudeness often adds to the sense of realism, I think. But yeah I definitely agree. 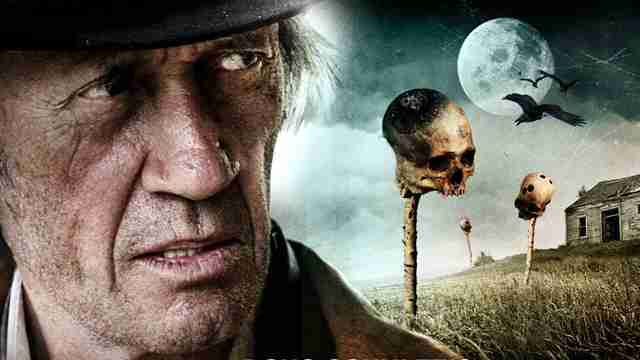 One can’t talk about Dark Fields without mentioning David Carradine and his passing. What sort of man was he and what did he bring to the film as a person? He was a complex guy who talked openly about his demons and drug addiction. He was clean and sober on our set and had an assistant who was keeping him on a strict health regiment. His Agent made sure we’d removed the mini-bar from his hotel room. We talked about his past and working with Bergman and Quentin. Kill Bill was his career high point and the period just after Kung Fu was his low point; it’s when he turned to drugs. I really got the sense that the guy was working for his survival and that he got a sense of worth out of being on a film set. He was eternally thankful for being hired and had talked about him reprising the role in a mini-series idea I was developing. He’s a pretty iconic actor and he had a foreboding presence. Were you intimidated directing him? Honestly, no, I wasn’t intimidated. I was excited by the idea and I think the more experienced or well known an actor is the more exciting the notion of being able to work with/direct them. It was a very memorable experience and I am very thankful I had the chance to direct him. Is horror a genre that you’d like to stay in or would you like to tackle other types of films? I’d love to venture into sci-fi and more dramatic fare.